I remember the images of Barbuda, and St. Thomas islands just after Hurricane Irma savaged them. The first visual impact to take in was the verdant foliage, the color green of leaf, stripped away by the winds. The bushes and trees are bereft of green and stand limp and assaulted in shades of brown wood and stem nakedness. The curves of once green hilly islands, all wind excoriated become earth browned-out backgrounds to the settlements that from the air look like they where houses of cards put through a paper shredder with bits of buildings piled up or scattered in wind and wave sculpted debris fields alongside piles of beached pleasure boats. Most of the houses, if they still had standing walls had no roofs exposing the private parts of indoor life, jumbled, half buried in sand or tangled in seaweed. Some of the walls had the paint stripped off by the invisible teeth of chewing cyclonic winds. The towns and harbors of once beautiful Barbuda and St. Thomas looked like they where ruins from the outer blast effects of an atomic attack by a “Hiroshima-Hurricane” that was Irma. Hold these images in mind and multiply them 100 times. A new Hurricane Maria has an air pressure dropping ominously into the 920-millibar region. It is traveling slow at 10 mph in a WNW storm track, setting up for a direct hit on the mountainous island and US territory of Puerto Rico as a monster Category 5. It could have sustained winds at landfall as high as 160 mph or it will hit the island as nearly as catastrophic high Category 4 with a throttling punch a mere 20 mph less. In another 24 hours Puerto Rico, the most mountainous and most densely populated Caribbean island with over 3.7 million people crowded mostly along its shoreline at 1,070 people per square mile will be surge-assaulted by nine-foot storm waves. It will be rain raped by upwards of two feet of downpours in one day. The jungle covered mountains will have much of their foliage ripped off breaking and resisting branches as the mountains their roots grab fast are penetrated violently by a soaking deluge that peaks and steep slopes use to catch the flood-soaked hurricane bands of “Holy” Sancta Maria, become the holy mother of all hurricane thumpings. I predict La Diabolica Maria will be far worse than the historic San Felipe Segundo Hurricane, the only Category 5 storm to blast Puerto Rico in a recorded history. That is, a record that will only last another 24 hours after Maria’s landfall makes it two bad-Cat 5 hits on Puerto Rico. San Felipe in 1928 killed 328 people and its devastation was catastrophic. Eighty-nine years later, the island is so much more developed and crowded with millions more people. I fear the death toll will be higher and the loss of property even harder to fathom. Beware at landfall the muddy offal of flooded mountain ranges that will bring killer landslides down into the densely populated lowlands. The brown storm surge downwards of mountain cataracts will compete with the upward storm surges from the sea. Maria’s bullseye attack of Puerto Rico will be by far the worse devastation yet seen in this historic hurricane season of 2017. After Category 4 Harvey’s US landfall made it a 100,000 home wrecker across Houston and Southeastern Texas there followed a week later Irma’s Category 4 US landfall leveling the works of man along the Florida Keys. Now comes a Category 5 US Territory landfall of Maria overnight. It will be the worst of the three landfalls, though probably the least reported because US colonies just don’t get much respect in so many ways. And guess what? This show’s still full on. We have a full two more months left in this 2017 Atlantic Hurricane Season. Remember, the unforgettable Hurricane Katrina in 2005 season slammed into New Orleans and the Mississippi coastline at the very end of September. Sandy blasted New York City in 2012 at the end of October into November. So far this uptick of the hurricane season starting in late August has already had an unprecedented two Category 4 hurricanes (Harvey and Jose) and two Category 5 hurricanes (Irma and Maria). Note the pattern—a pattern my Oracle has told you all to brace for in these times of ever-warming oceans. When storms draw sustenance from hot waters at 85 to near 90 degree Fahrenheit surface temperatures it’s like Popeye eating spinach. Hurricanes sudden have superpowers. All four hurricanes I just listed made these sudden and unanticipated jumps in dilating power with Maria being the fastest, jumping from Cat 3 to 4 in 24 hours to 5 in another hour or so after that before it buzz sawed Dominica island and the other Leeward Islands. Is this not a new abnormal? Is this not what happens when temperatures for August 2017 in the Northern Hemispheric summer season, baking the tropical waters made it the third hottest August on record? It was only bested by August 2016 and August 2015 as the first and second hottest Augusts ever recorded. This is a streak of intensifying global warming. 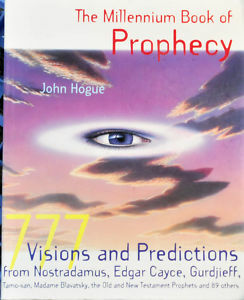 Click on the cover to explore this deluxe, fully illustrated prophecy classic. My Oracle foresaw the climate change tipping point being reached in 2010, far earlier than science was expecting. Ever since I first wrote about this on 1 November 2009 for Predictions for 2010, a temperature tsunami of heat records took off in 2010. Indeed in 2010 and through 2011, an initial flood of reported hotter records spiked on the record charts like a tsunami wave would do. Yet rather than the wave cresting and falling, it kept surging record breaking temperatures at the cresting point and the flood didn’t weaken but slowly mounted and mounted to higher temperatures in 2011, 2012, 2013, 2014, 15, 16, 17 and so it goes on. It’s like a leviathan unable to find satiation. A fire dragon climate breathes more heat-fired mega droughts, fires and superstorms upon us. These are all the symptoms of a climate-tipping heat up of Planet Earth. What follows a temperature tsunami are a rising frequency of disasters lowered upon humanity and the world. This Atlantic Hurricane Season is not an anomaly, but the new abnormal, aided by a more globally warmed and empowered La Niña cycle that opens the wind-shearing gates to Atlantic cyclonic storms making landfall rather than see their thunderclouds sheared of misty Samson-powered manes to evaporate bald and harmless clouded remains over peaceful US and Caribbean shores. The days are beginning to end when people suffering one devastation, from which they can recover because years of relative weather peace allows it. Reconstruction and especially economic recovery, takes time, and now the storm events won’t give you the time. The girl hurricane wrecking crew of Irma and Maria are currently taking down the neighboring US Territory the US Virgin Islands with demolition number one coming from Irma just a few weeks ago, with wind and wave blasting the northern tier of St John and St Thomas Island chain, missing the southward sitting St. Croix. The latter island became a haven for those in the north who had Irma blow their houses down and tear every green leaf away. In comes Hurricane Maria. In the next 24 hours it will finish Irma’s demolition job. The winds of Maria’s outer tropical storm feeder bands will knock over what weakened walls and semi-destroyed roofs are still standing in the northern US Virgin Islands. 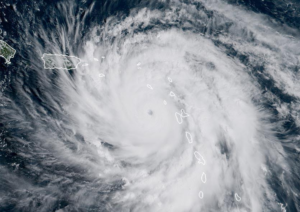 At the same time her very tight eye wall will grind St. Croix with sustained 160 mph winds and 10-foot storm surges, thus taking the territory completely down to rubble and bare hills within just two weeks of two Category 5 landfalls. Earlier today, Maria of the Irma-Maria demolition team blew a similar “kick down what’s still standing” blow on the Leeward Island edifices of man, flattened by Irma with Maria’s outer hurricane feeder bands while her storm center sought new targets of demolition and denuding. Dominica received a direct his and Guadeloupe slightly to the north saying, hi, “hell-Oh!” to Maria’s northern hurricane wall of killer thunderstorms. Initial reports indicate Dominica suffered catastrophic damage and Guadeloupe was severely visited by the second kitty of Mother Nature’s two tiger Cat Five’s. This is the way of the future for many countries to come. This is when the warming world begins to strike the follies of humanity in more rapid visitations until they are too rapid to repair and allow civil and economic recovery to the destroyed areas. The mounting devastation will cause a strain on the US economy so great that it could cause an economic depression from natural disasters. This could be the beginning of a crisis for the “canary in the mineshaft” of economic supersystems: the Insurance Industry. Imagine a world where relentless natural disasters give no pause to insurance payouts, thus collapsing the insurance industry around the planet. Serial disasters will only increase as long as humanity either abjectly denies global warming or pretends its feel-good “accords” in Paris, signing up 194 nations without legal teeth can really galvanize people to bring back some balance to the climate, or at least slow down what humanity has unleashed on itself. Paris presented the “buddy-buddy” system for making hard choices about abandoning fossil fuel use for other energy alternatives. Ah, isn’t that cute… But not a cure. Rather than rebuild, the millions living in the serially assaulted Caribbean Island nations and US territories, the outlying and easily flooded lands of Southeast Texas and Southern Florida, the wind-blasted keys ground down again and again to the foundation bones by storms, will not rebuild. The millions who once lived there will become global warming’s refugees. They will have to move far inland, to higher grown under calmer skies—if there are any. The greatest migrations in history are before us in the 2020s. Today 60 million people are displaced. In ten years 600 million will be the number of those fleeing the storms in the flooded coastal regions meeting the millions emerging from the oven interiors of continents suffering sustained mega droughts. This nightmare scenario will really begin kicking in now and intensify as we enter the 2020s. I know this article is terrifying, but this author and his “Oracle” is here to scare you like Nostradamus used to scare people—scare you straight. Help you see your house in space is on fire and you are all the unwitting arsonists. A change of consciousness must happen. An understanding that the human race is battling a planetary emergency. Only as things get worse, as disasters become serial assaults that entire countries can’t cope with, including, and especially, the United States, that’s good. This hell on earth we’ve made of the planet has a silver lining of sharp-edged, shared and awakening awareness of the danger to our future. These travails of our own making can be our undoing or transformation. Before a greater humanity can arise, it must come out of the asinine-ash-inane-minded current semi-sentient human stock, you and I. Yet in you and I is a potential seed of a better humanity, a humanity I will be writing much more about from now on because it’s time for the prophecies of a new humanity to be proclaimed. It is imperative that I do so as we are now deep into the global emergency time I have tried to prepare you all for since I began writing about the future as far back as 1983. Each of us only need look at ourselves honestly, with no filters and witness ourselves living unconsciously in so many ways to understand that even shocks like those happening to us around the world are necessary for our awakening. But such a deep self-examination that meditation can be, can illuminate also, the possibility that though the problems of each of our unconsciously lived lives seems vast and burdened by the past, and afraid of the future, in this present moment of meditation, all our problems could be nothing but shadows dispelled by its still small candle light of witnessing. This new book is available now. Click on the cover and read what seismic events may be coming in the next 5 years. Is this not a quickening of upheavals of the Earth against human kind? Mother Nature’s superhurricane storms rolling into the Caribbean since the end of August has been punctuated now by TWO major temblors in Mexico in less that two weeks: a 72-mile deep, 8.1 magnitude along the Oaxaca and Chiapas coastal regions of Southwest Mexico 11 days ago. (Read more about that quake, click on the Climate Intensifies—Part One). And now a 7.1 “shallow epicenter” magnitude quake just 78 miles ESE of Mexico City. Not only that, but it happened around lunchtime on the 32-year anniversary of the Great 8.0 magnitude Mexico City Earthquake of 19 September 1985 that killed between 5,000 to 45,000 and injured 30,000. Today’s quake on the 32nd anniversary was “32” miles deep. In seismic terms that is quite shallow, which means the long “rolling” frequency is matched by a higher intensity of sharp, short frequency up-and-down shaking that brings down buildings. Initial reports are still coming in, but from what cellphones have recorded and from what I’m hearing, this will be a significantly damaging quake around a wide area of Central Mexico, not has historic in loss of life and property as the 1985 temblor, but significant all the same. This new book is now available. Click on the cover to reach the Amazon sales page for one-click purchase. Thank you. As with the earlier temblor in Southwest Mexico just 11 days earlier on 8 September, a possible influence of the Moon’s shadow during the Great American Eclipse may have been in play. Briefly for the uninitiated to my theory, after a total eclipse of the sun, there seems to be heightened seismic activity most frequently where the shadow passed at 95 to 100 percent totality, although major tsunami and temblor action can happen to a lesser degree around 60 percent and higher. The window for temblors can begin days, weeks, months or upwards of five years after the shadow has passed over sensitive seismic areas. The shadow of the 21 August total eclipse over the impacted region in Mexico was between 40 and 45 percent totality, which is more than the Oaxaca temblor, which was 30 to 40 percent. It would seem that my astrological computations are bearing a lot of bitter-fruitful accuracy for earthquake windows in September. Check out John Hogue’s Worldwide Astrological Predictions for earthquake windows into May of next year. It can help you to prepare for them and stay safe. Finish the conclusion of the fourth article from part one and gain access to an additional three compelling articles remaining by donating $5.00 or a little more HERE. Put John in the PayPal memo line. When I see your donation confirmed I will manually send you a fully illustrated PDF file attached to the email address you have used, entitled, Climate Intensifies PART TWO. This entry was posted in Global Warming and tagged 2017 Atlantic Hurricane Season, Category 4, Category 5, Central Mexico Earthquake, Chiapas, climate change, Climate change tipping point, climate intensifies, Dominica, global warming, Great American Eclipse, Guadeloupe, Harvey, Hurricane Harvey, Hurricane Irma, Hurricane Maria, Irma, Irma and Maria, Leeward Islands, Maria, Meditation, Mexico City, Mexico City Earthquake, Mother Nature, New Humanity, Oaxaca, Oaxaca earthquake, prediction, predictions, prophecies, prophecy, Puerto Rico, Serial disasters, St. Croix, St. Thomas, US Virgin Islands. Bookmark the permalink. Post a comment or leave a trackback: Trackback URL.